There are people who complain about musicals by saying that in real life, people just don’t break out into song. I guess being a churchgoer makes me view musicals in a more kindly way. For at least an hour a week, I’m surrounded by people breaking out in song, so it doesn’t seem so strange. Now, street gangs dancing ballet in West Side Story? That might be pressing things. Lee Marvin and Clint Eastwood as serenading prospectors in Paint Your Wagon might be pressing it further. Guys and Dolls might be stretching credibility even further with singing and dancing gangsters and gamblers, but you won’t hear me complaining. 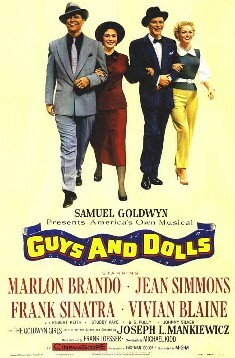 The songs are hummable, and Damon Runyon’s jokes (adapted by Ben Hecht and Joseph Mankiewicz) are funny. But how is the church in the film? 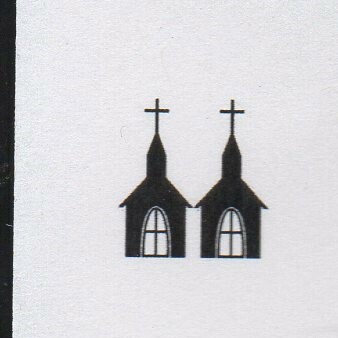 Or is there a church in the film? According to Sister Sarah Brown (played by Jean Simmons) , who runs it, the “Save a Soul Mission,” is a mission, not a church. But like many Salvation Army Missions, it sure seems like a church. And Sister Sarah preaches, so we’ll consider her clergy. So what are the pros and cons of the mission? It gets points for locating in a neighborhood of New York where crooks and thieves are plentiful (Salvation Army General Cartwright says they’ve located among the Devil’s first line troops). Sarah is willing to go on the streets along with her band to take on all comers, but a con man selling $1.00 solid gold watches seems to attract more attention. Another positive element about the mission is found in their signs. I’m not referring to the signs that proclaim Scripture, because, as gambler Sky Masterson notes, the references are wrong. (He correctly notes that “There is no peace for the wicked” comes from Isaiah, though the sign says it’s from Proverbs.) But the sign offering free donuts is a pretty great sign. The mission eventually opens their doors to the most notorious gamblers of the neighborhood and makes a convert of a gambler named Nicely-Nicely Johnson (though how big a challenge it is to convert someone named “Nicely” is another story). So there’s a lot to be said in favor of the Save A Soul Mission. My problems are found in the person of Sister Sarah Brown. As a single woman running the mission, she makes the dubious decision of accompanying Sky Masterson on a trip to Cuba, though she is, to some extent, tricked into it. I wouldn’t think it wise of a male clergyman to join a woman of reputation on a date in a foreign land. Then she gets herself into a drunken brawl (though, again, the drunkenness is the result of trickery). You know if that happened today, that fight would be on YouTube, and Sarah would have to be explaining herself to the general and press tout de suite. My real problem with Sarah is something she says about the gamblers who sneak into the missions for a craps game. After the police chase them out, Sarah refers to those who were in the mission as “trash.” I think it’s safe to say that one isn’t who thinks of potential converts in this way is not following the example of Jesus, the Friend of sinners. Another worker in the Mission, Sarah’s Uncle Arvid seems to be a “right guy;” though I was puzzled when he concluded a wedding citing the authority of the city, county and state of New York, but not God. 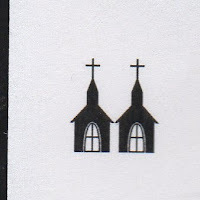 So we’re giving the Mission Two Steeples. Enjoyed this film, unlikely as the story was. Tracy is now "Bible Doll."